The Trump administration today approved five permits that allow harm to whales, dolphins and other animals so companies can search for oil off the Atlantic Coast using loud seismic airgun blasts. Allowing these exploration activities from Delaware to Florida is the first step toward opening the Atlantic to new oil drilling, as the administration proposed in January. The announcement comes following the death of at least 20 endangered North Atlantic right whales since April 2017, and years of population decline. Scientists estimate that the population now contains only 411 animals. The permits allow the firing of seismic airguns from ships every 10 seconds, 24 hours a day, for weeks at a time, at a noise level that would rupture a human eardrum. More than 220 municipalities along the Atlantic and Gulf coasts have formally opposed oil and gas drilling and seismic airgun blasting. Shortly before leaving office, the Obama administration denied these seismic applications, partly because of their harmful impact on right whales and other marine mammals. But in May 2017, the Trump administration revoked that denial and announced it was reconsidering the permits. In 2015, 75 scientists found that opening the Atlantic Ocean to seismic airgun exploration “poses an unacceptable risk of serious harm to marine life.” The scientists also warned of “significant, long-lasting, and widespread” harm to fish and marine mammal populations should the blasting proceed. 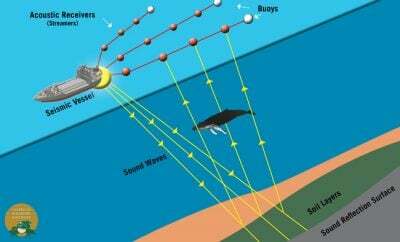 The seismic blasts, which can reach more than 250 decibels, can cause hearing loss in marine mammals, disturb essential behaviors such as feeding and breeding over vast distances, mask communications between individual whales and dolphins, and reduce catch rates of commercial fish. Today’s approvals were issued by the National Marine Fisheries Service under the Marine Mammal Protection Act to Spectrum Geo Inc., TGS-NOPEC Geophysical Company, ION GeoVentures, WesternGeco, LLC and CGG. The companies also need permits from the Bureau of Ocean Energy Management.